Academic Staff Union of Universities, ASUU, is adamant on Government meeting all their demands before they call off their current strike. They have also shown that this strike is not only to fight for their own entitlements but for the overall good of the Nigerian University and education system at large. 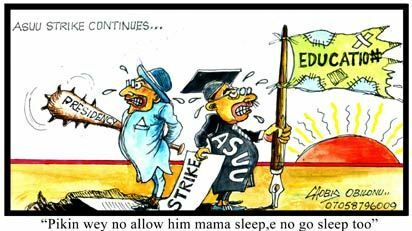 Rising from its congress at the Delta State University (DELSU), Abraka, Benin Zone of the Academic Staff Union of Universities (ASUU) on Wednesday night, the Union vowed that the ongoing industrial action by lecturers would not be called off despite the release of N100 billion by the Federal Government to ease the burdens in the universities. The union accused the Federal Government of divide and rule by trying to buy the Committee of Pro-Chancellors and Committee of Vice Chancellors with the recent release of another N30 billion, saying such policy would not divide them. Coordinator of ASUU in the zone, Sunny Ighalo, insisted that until government adhered strictly to the agreement earlier reached by both parties, the lecturers will not return to the classroom. “The ASUU has been on a nationwide total and indefinite strike to express its frustration over the continuing reluctance of government to fully implement vital aspects of the 2009 FGN/ASUU agreement as captured by the MoU of January 2012. “This struggle, which has now entered its ninth week, is driven by the unshakable resolve of our members to stem the continuing trend with successive governments of Nigeria, to systematically destroy public education through neglect and near total abandonment. “The strike has indeed moved into a critical stage where government is now applying the instrument of intimidation and blackmail and other gimmicks to undermine the struggle,” Ighalo said. At the end of their meeting a statement was signed by Chairman of DELSU ASUU, Emmanuel Mordi; Chairman of UNIBEN ASUU, Anthony Moye-Emina; Chairman of AAU ASUU, Fred Esumeh; Chairman of NDU ASUU, Beke Sese; and Ighalo himself. The lecturers accused government of being insensitive to the plight of Nigerians by not meeting their demands as contained in the MoU. Ighalo insisted that the union was not on strike to make fresh demands, and neither was it ready to renegotiate the existing agreement. Rather, “We are calling on the government to implement the 2009 ASUU/FGN agreement it willingly signed with the union in 2009,” he added. According to him, though N500 billion was expected from the government based on Needs Assessment carried out and contained in the MoU of January 2012 for revitalisation of the universities, government claimed it distributed N100 billion most of which were promissory notes. He appealed to parents and students to understand the lecturers’ position, noting that it was to help the education system in the country which had almost collapsed. But Minister of Information, Labaran Maku, himself on Thursday pleaded with Nigerians to try to come to terms with the predicament government faces in all sectors of the economy and refrain from assessing the administration of President Goodluck Jonathan as under-performing. Maku, who spoke against the backdrop of the ASUU strike at an interactive forum with journalists in Abuja, said huge money being spent on the sustenance of peace, particularly in the crisis-ridden North East states, was indirectly having its toll on the resources available for educational development. “People are quick to point accusing fingers on the Federal Government, even when things are not working at the state level. “Take the issue of primary school education for instance, it is the responsibility of states and local governments to provide basic education for citizens in their states, not the responsibility of the Federal Government, but we go out of our way to intervene in the education sector, which accounts for why Federal Government released funds for the building of ‘almajiri’ schools in the North. “What ASUU is clamouring for bothers on allowances, not unpaid salaries and government has provided N30 billion for a start, yet they are not satisfied. “It is not only in education that we have challenges, we have challenges in almost all the sectors, from insecurity, aviation, agriculture, power and a host of others. “But we appeal to Nigerians to understand our predicament as a nation, look at what we have spent on insecurity, which is far higher than education; we are calling on our people to give peace a chance, as we generate more monies through tax revenues more funds will then go into education,” he stated. Benue State Governor, Gabriel Suswam, also spoke on the strike, calling on students to engage members of the ASUU in dialogue, stressing that the lecturers have no reason being on strike. The Governor, who noted that the Federal Government had on Tuesday released another N30 billion for federal universities in the country, added that his own state university – Benue State University (BSU) – has already received about N950 million from the N100 billion earlier released by government. The Governor spoke when he hosted officials of the National Union of Benue State Students (NUBESS) led by its President, Matthew Mamwoo, at the Government House, Makurdi, on Thursday. Suswam lamented a situation whereby ASUU was still insisting that government pay a total of N92 billion because “it is not practical” after government has shown commitment by paying N30 billion. Related: Latest ASUU News Update!